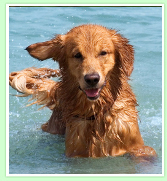 Mission: Our mission is to find safe, loving, lifelong homes for Golden Retrievers. No Golden Retriever will be turned away, regardless of medical needs or age. What We Do: AGB takes in dogs from Birmingham and surrounding areas (and in some cases States). Every dog goes through a wellness check with our veterinarians. Vaccinations, neutering and spaying, heartworm treatment and any other medical issues are all dealt with where needed. Dogs placed in our system are evaluated not just for health but also for temperament with our experienced dog trainers. It is our goal to place the right dog in the right home. Therefore, it is important to know whether a particular dog is good with other dogs, young children or cats. Some Goldenâ€™s are high energy and will need a lot of exercise, others are more laid back and just want as many belly rubs as possible. This is why our adoption process is so thorough. It can be very disconcerting to a dog and distressing to adoptive parents to have to return a dog to us because it simply wasnâ€™t the right fit. Education: We are intent on educating and assisting the general public, and dog owners specifically, regarding issues such as responsible pet ownership, spay/neutering, obedience training, and heartworm prevention. 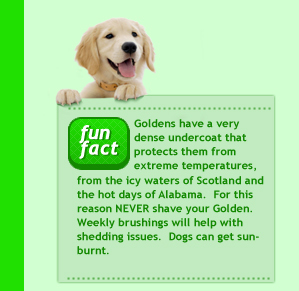 Our goal is to reduce the number of Golden Retrievers sent to shelters or surrendered. Financial: AGB relies solely on donations and has a 501 (c) (3) classification with the IRS. Your donation is tax deductible. We also meet the requirements for corporate matching, employee giving and volunteer grant programs.